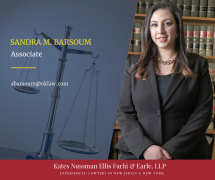 Sandra M. Barsoum is an associate of the firm, admitted to the bars New Jersey and New York in 2015. A graduate of New Jersey City University, formally the Teachers College of New Jersey, Sandra earned a Bachelor's Degree in Political Science. While at New Jersey City University, Ms. Barsoum sat on the Board of Trustees as the Student Representative and served as the Executive Vice President of the Student Government Organization. During her time in college, Sandra was the Lead Field Organizer for various political campaigns and also participated in several Mock United Nations Conferences. Sandra is a member of the Alpha Phi Omega fraternity. After college Sandra attended Michigan State University in Lansing, Michigan. As a first year law student, Sandra was a semi-finalist in the Mock Trial Competition, and won "Best Overall Advocate" in the Moot Court Competition. In her second year, Sandra externed for the Honorable Judge Curtis J. Bell of the Kalamazoo County 9th Circuit Court-Family Court Division in Kalamazoo, Michigan. In the third year, Sandra interned with the Legal Services of South Central Michigan, which provided legal advice and representation to low income client in areas such as consumer law, housing law, and family law. Prior to joining the firm, Sandra worked at Pension Evaluators at Troyan, where she drafted Domestic Relations Orders splitting assets in defined benefit and defined contribution plans - acquired during the marriage, pursuant to marital divorce agreements. Sandra is an active member of the New York State Bar Association, the New Jersey State Bar Association, and the Young Lawyer's Division in the State of New Jersey.